What is Blind Nailing in Hardwood Floor Installations? In our review of the DuoFast Floormaster 250BN we make substantial reference to the term blind nailing when describing fastening the first few and last few hardwood boards in place. If you’ve never heard the term blind nailing, you’re probably wondering what exactly it means. Blind nailing is setting a nail into the hardwood flooring board at a 45 degree angle, just above the tongue of the board and driven down into the joist or subfloor surface. In olden times, blind nailing was done with a hammer to start the nail, then as a woodworker got close to the wood, a nailset was used with the hammer to countersink the nail into the material. The technique hides the nail as the next board is installed. In hardwood installations today, we’re blessed with pneumatic tools that take much of the hard manual labor out of the job. Just about any finish nailer can be used for blind nailing. One of the notable features of the Floormaster 250BN that DuoFast sent us is that it comes pre-loaded with a 45-degree angled tip to support accurate blind nailing. (You’ll immediately recognize this as a nice feature if you’ve ever tried to blind nail hardwoods using a flat tip). It’s worth noting that technically an entire modern-day floor is blind nailed, but not all with the same tool. Most of the floor is installed with a hardwood flooring stapler or nailer, specifically designed for blind nailing boards. This tool is sometimes called a toe nailer. 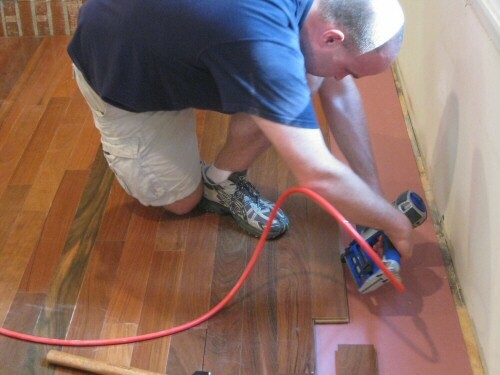 Hardwood installers generally reserve the term blind nailing for the first few and last few boards that must be installed with a finish nailer because the larger hardwood flooring tool won’t fit. Beyond working on flooring, blind nailing can refer to hiding a nail beneath a chip of wood, as described in this article, which is a pretty slick woodworking trick. This article is part of our How to Install Hardwood Flooring series – a set of articles that describes all the steps necessary to install wood floors. Click that link for more information. Nice article! I think blind nailing is a genius method of securing flooring boards or other varieties of tongue and groove etc. Pneumatic tools are definitely the way to go on this one! Never heard of the tool to live a chip of wood to nail into and then glue the chip back over the nail. Genius! I’m going to send that info to my hubby before we install wood floors in our bedrooms. Thanks so much Fred! Helps me to appreciate the work that went into the original oak flooring in our house. It needs refinishing, and I know that will be quite a job. Suggestions? We’re big fans of paying for refinishing. It’s a bit of an art, and if you do it wrong, you can ruin the floors (or at least, make the floors look pretty bad). When wouldn’t you put a glue down on concrete slab? Have one down for 15 yrs, putting down new, but obvious moisture areas noted. How would you prep for this type slab? I definitely wouldn’t put one down if there were any moisture issues. I am partial to tile and carpet over slabs because of the moisture problem. If you really want wood, I recommend engineered wood at a minimum, and maybe a laminate product. Hi Fred, great series of articles!! I am going to do about 250 sqft of 3/4 solid red oak in my livingroom soon and most of the know how i got was from this site! Now the only question i have is that can i use 1 1/4 inch nails when blind nailing the first few rows?